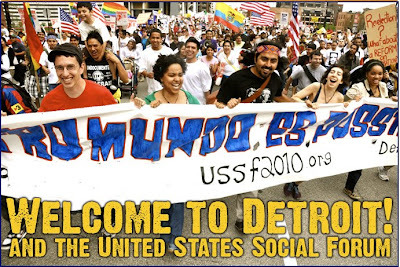 Twenty-five thousand people have descended on Detroit for the second US Social Forum. If 1967 was a rebellion here; this is an uprising. It is an explosion of spirit and connection; an understanding that systemic change is necessary and that people are coming together to make it happen. Dominated by a youthful sea of multi-racial faces, this five-day event features over a thousand workshops promoting the promise that another world is possible. Forums and People’s Movement Assemblies are following fourteen different tracks including: Capitalism In Crisis; Climate Justice; Strategies For Building Power and Ensuring Community Needs; Indigenous Sovereignty; and International Solidarity. The Social Forum grew as a counterpoint to the annual World Economic Forum in Davos, Switzerland where the political and financial elite convene to devise a global future based on markets and resource depletion rather than people and sustainability. For the past decade Social Forums have been held across the planet building a vibrant vision of a healthy and empowerment. With the US as a leader of the global corporate empire that is depleting resources, poisoning the planet and destroying our rights to a stable climate and functioning economy, people in this country have come to realize that change must begin at home This second US Social forum, with twice the participation of the 2007 Social Forum in Atlanta, is concentrating on that idea. The Alliance for Democracy is deeply involved, leading workshops on the right to water and our community commons. As a founder of the Campaign to Legalize Democracy, AfD is working the crowd to end corporate personhood and empower local communities to protect their culture and resources. Another world is possible and this grand gathering is leading the way.